HMP, a leading health care education and events company, today announced that its EMS World Expo has once again been recognized by Trade Show Executive as one of the “Fastest 50” trade shows in the US, in both attendance and square footage growth. The list was developed from 2018 trade show data and is ranked by overall statistical growth for that period. Winners will be honored during the 2019 “Fastest 50” awards ceremony, taking place June 18-20 in Atlantic City, New Jersey. 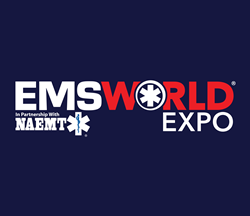 Owned and produced by HMP, EMS World Expo is the largest EMS-dedicated event in the world and annually attracts thousands of emergency medical technicians and paramedics. With more than 250 educational sessions, EMS World Expo sets the standard in EMS education, offering the latest information, tools, technologies, and trends in pre-hospital care. In 2018, EMS World Expo attendance exceeded 6,700 individuals from 50 states and 55 countries. In addition to a trade show floor spanning upwards of 100,000 sq. ft., the 2018 exposition featured more than 340 exhibitors showcasing innovative products, services, and technologies to help EMS providers improve patient care, enhance provider safety, and increase operational efficiencies. The 2019 EMS World Expo will take place October 14-18, in New Orleans, Louisiana. For more information, visit emsworldexpo.com. As the largest EMS-dedicated event in the world, EMS World Expo, hosted in partnership with the National Association of Emergency Medical Technicians (NAEMT), annually attracts more than 6,000 EMS professionals. EMS World Expo sets the standard in EMS education, offering the training professionals need to do their jobs today, with the progressive curriculum and technology that provides the solutions for tomorrow. HMP is the force behind Healthcare Made Practical – and is a multichannel leader in health care events and education, with a mission to improve patient care. The company produces accredited medical education events and clinically relevant, evidence-based content for the global health care community across a range of therapeutic areas. Its brands include Consultant360, the year-round, award-winning platform relied upon by primary care providers and other specialists; Psych Congress, the largest independent mental health meeting in the U.S.; EMS World Expo, the largest EMS-dedicated event in the world; Rx Drug Abuse & Heroin Summit, the nation’s leading meeting focused on addressing the opioid abuse epidemic; and the Symposium on Advanced Wound Care (SAWC), the largest wound care meeting in the world. For more information, visit hmpglobal.com.